The days of modeling your tools in CAM are coming to an end. Harvey Performance Company has partnered with Autodesk to provide comprehensive Harvey Tool and Helical Solutions tool libraries to Fusion 360 and Autodesk HSM users. Now, users can access 3D models of Harvey and Helical tools with a quick download and a few simple clicks. Keep reading to learn how to download these libraries, find the tool you are looking for, how to think about speeds and feeds for these libraries, and more. To download one of our tool libraries, head to https://cam.autodesk.com/hsmtools. There you will find Harvey Tool and Helical Solutions tool libraries. You will be able to sort by vendor or use the search bar to filter results. There will be a download option for both Fusion and HSM. From there, you will need to import the tool libraries from your Downloads folder into Fusion 360 or HSM. These tool libraries can be imported into your “Local” or “Cloud” libraries in Fusion 360, depending on where you would like them to appear. For HSM, simply import the HSMLIB file you have downloaded as you would any other tool library. Curt Chan, Autodesk MFG Marketing Manager, takes a deeper dive into the process behind downloading, importing, and using CAM tool libraries to Fusion in the instructional video below. For HSM users, jump to the 2:45 mark in this video from Autodesk’s Lars Christensen, who explains how to download and import these libraries into Autodesk HSM. Once you have downloaded and imported your tool libraries, selecting a specific tool or group of tools can be done in several ways. To search by tool number, simply enter the tool number into the search bar at the top of your tool library window. For example, if you are looking for Helical Tool EDP 00015, enter “00015” into the search bar and the results will narrow to show only that tool. In the default display settings for Fusion 360, the tool number is not displayed in the table of results, where you will find the tool name, flute count, cutter diameter, and other important information. If you would like to add the tool number to this list of available data, you can right click on the top menu bar where it says “Name” and select “Product ID” from the drop down menu. This will add the tool number (ex. 00015) to the list of information readily available to you in the table. To search by a keyword, simply input the keyword into the search bar at the top of the tool library window. For example, if you are looking for metric tooling, you can search “metric” to filter by tools matching that keyword. This is helpful when searching for Specialty Profile tools which are not supported by the current profile filters, like the Harvey Tool Double Angle Shank Cutters seen in the example below. To search by tool type, click the “Type” button in the top menu of your tool library window. From there, you will be able to segment the tools by their profile. For example, if you only wanted to see Harvey Tool ball nose end mills, choose “Ball” and your tool results will filter accordingly. As more specialty profiles are added, these filters will allow you to filter by profiles such as chamfer, dovetail, drill, threadmill, and more. However, some specialty profile tools do not currently have a supported tool type. These tools show as “form tools” and are easier to find by searching by tool number or name. For example, there is not currently a profile filter for “Double Angle Shank Cutters” so you will not be able to sort by that profile. Instead, type “Double Angle Shank Cutter” into the search bar (see “Searching by Keyword”) to filter by that tool type. To search by tool dimensions, click the “Dimensions” button in the top menu of your tool library window. 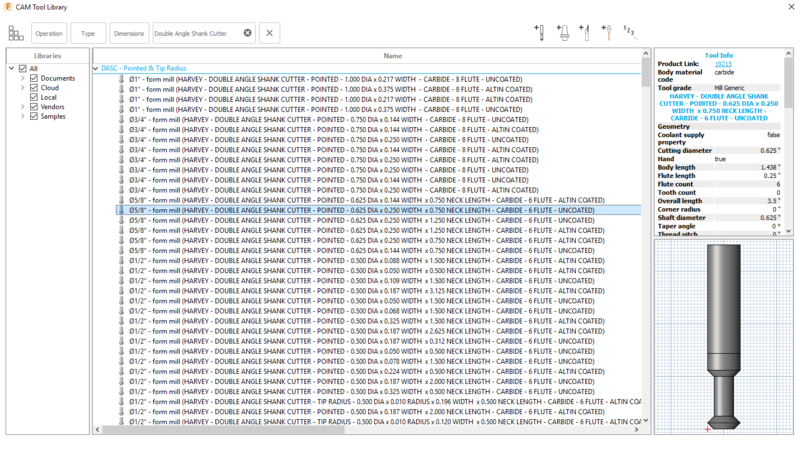 From there, you will be able to filter tools by your desired dimensions, including cutter diameter, flute count, overall length, radius, and flute length (also known as length of cut). 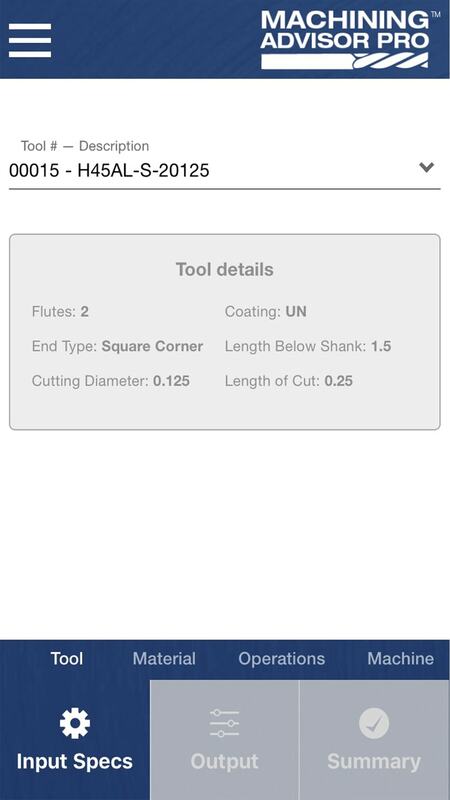 For example, if you wanted to see Helical 3 flute end mills in a 0.5 inch diameter, you would check off the boxes next to “Diameter” and “Flute Count” and enter the values you are looking for. From there, the tool results will filter based on the selections you have made. 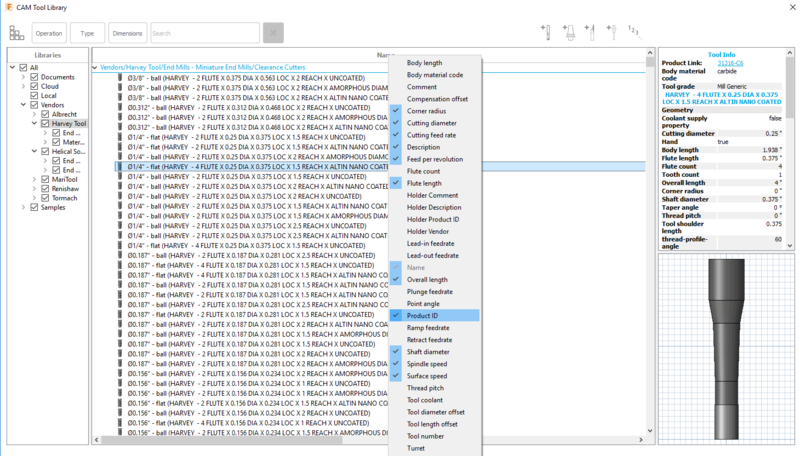 Due to the differences in naming conventions between manufacturers, some Harvey Tool/Helical specialty profile tools will not appear exactly as you think in Fusion 360/HSM. However, each tool does contain a description with the exact name of the tool. For example, Harvey Tool Drill/End Mills display in Fusion 360 as Spot Drills, but the description field will call them out as Drill/End Mill tools, as you can see below. Below is a chart that will help you match up Harvey Tool/Helical tool names with the current Fusion 360 tool names. To ensure the best possible machining results, we have decided not to pre-populate speeds and feeds information into our tool libraries. Instead, we encourage machinists to access the speeds and feeds resources that we offer to dial accurate running parameters based on their material, application, and machine capabilities. To access speeds and feeds information for your Harvey Tool product, head to http://www.harveytool.com/cms/SpeedsFeeds_228.aspx to find speeds and feeds libraries for every tool. 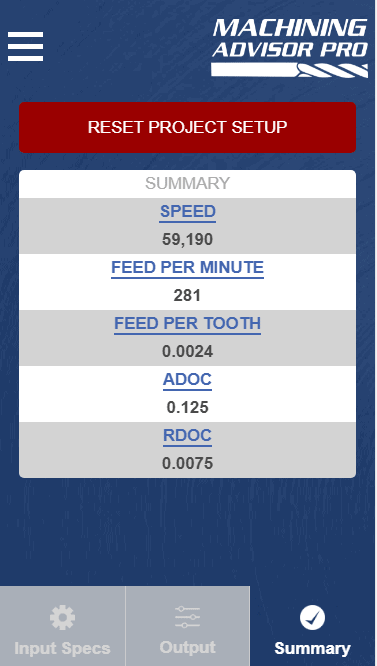 If you are looking for tool specific speeds and feeds information, you will need to access the tool’s “Tech Info” page. You can reach these pages by clicking any of the hyperlinked tool numbers across all of our product tables. From there, simply click “Speeds & Feeds” to access the speeds and feeds PDF for that specific tool. If you have further questions about speeds and feeds, please reach out to our Technical Support team. They can be reached Monday-Friday from 8 AM to 7 PM EST at 800-645-5609, or by email at harveytech@harveyperformance.com. To access speeds and feeds information for your Helical Solutions end mills, we recommend using our Machining Advisor Pro application. 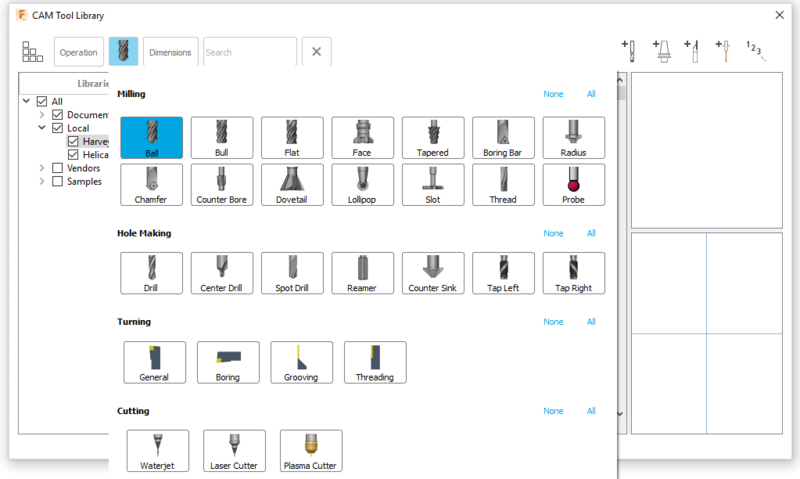 Machining Advisor Pro (MAP) generates specialized machining parameters by pairing the unique geometries of your Helical Solutions end mill with your exact tool path, material, and machine setup. MAP is available free of charge as a web-based desktop app, or as a downloadable application on the App Store for iOS and Google Play. To learn more about Machining Advisor Pro and get started today, visit www.machiningadvisorpro.com. If you have any questions about MAP, please reach out to us at webapps@harveyperformance.com. If you have further questions about speeds and feeds, please reach out to our Technical Support team. They can be reached Monday-Friday from 8 AM to 7 PM EST at 866-543-5422, or by email at helicaltech@harveyperformance.com. For additional questions or help using tool libraries, please send an email to webapps@harveyperformance.com. If you would like to request a Harvey Performance Company tool library be added to your CAM package, please fill out the form here and let us know! We will be sure to notify you when your CAM package has available tool libraries. Machining Advisor Pro (MAP) is a tool to quickly, seamlessly, and accurately deliver recommended running parameters to machinists using Helical Solutions end mills. 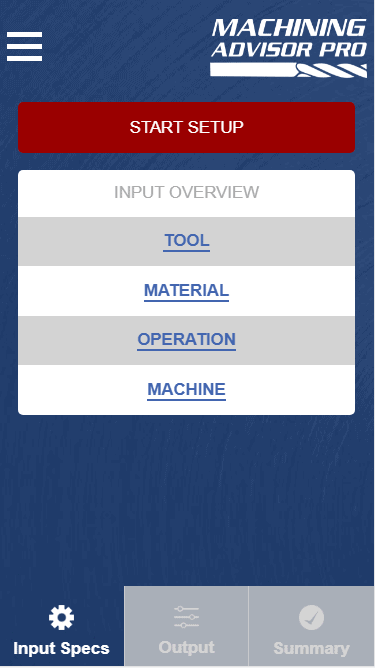 This download-free and mobile-friendly application takes into account a user’s machine, tool path, set-up, and material to offer tailored, specific speeds and feed parameters to the tools they are using. 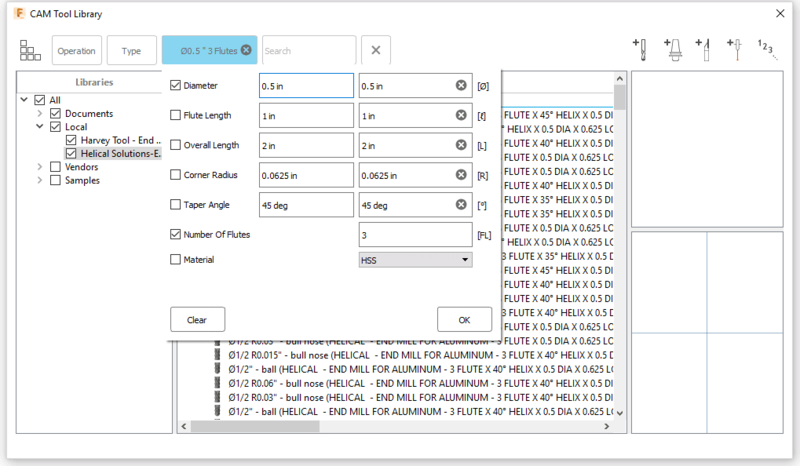 This section will provide a detailed breakdown of Machining Advisor Pro, moving along step-by- step throughout the entire process of determining your tailored running parameters. 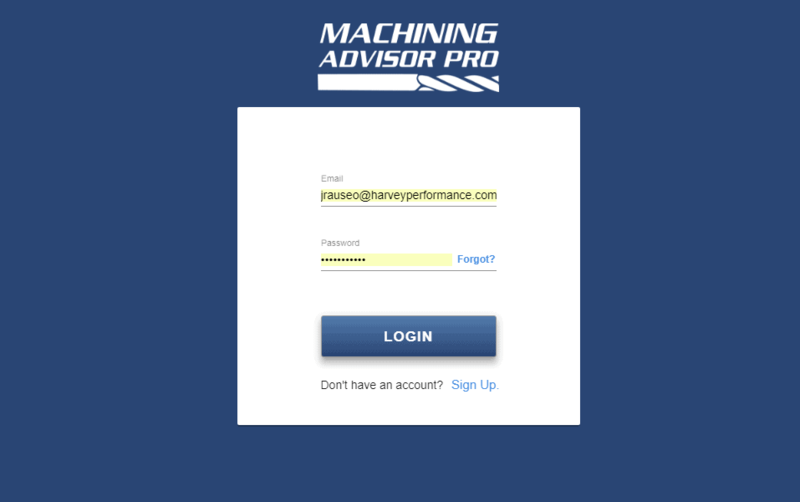 To begin with Machining Advisor Pro, start by accessing its web page on the Harvey Performance Company website, or use the mobile version by downloading the application from the App Store or Google Play. Whether you are using Machining Advisor Pro from the web or from your mobile device, machinists must first create an account. The registration process will only need to be done once before you will be able to log into Machining Advisor Pro on both the mobile and web applications immediately. The final step in the registration process is to activate your account. To do this, simply click the activation link in the email that was sent to the email address used when registering. If you do not see the email in your inbox, we recommend checking your spam folders or company email filters. From here, you’re able to begin using MAP. A user’s experience will be different depending on whether they’re using the web or mobile application. For instance, after logging in, users on the web application will view a single page that contains the Tool, Material, Operation, Machine, Parameter, and Recommendation sections. On the mobile application, however, the “Input Specs” section is immediately visible. This is a summary of the Tool, Material, Operation, and Machine sections that allows a user to review and access any section. Return to this screen at any point by clicking on the gear icon in the bottom left of the screen. To get started generating your running parameters, specify the Helical Solutions tool that you are using. This can be done by entering the tool number into the “Tool #” input field (highlighted in red below). As you type the tool number, MAP will filter through Helical’s 3,400-plus tools to begin identifying the specific tool you are looking for. Once the tool is selected, the “Tool Details” section will populate the information that is specific to the chosen tool. This information will include the type of tool chosen, its unit of measure, profile, and other key dimensional attributes. Once your tool information is imported, the material you’re working in will need to be specified. To access this screen on the mobile application, either swipe your screen to the left or click on the “Material” tab seen at the bottom of the screen. You will move from screen to screen across each step in the mobile application by using the same method. In this section, there are more than 300 specific material grades and conditions available to users. The first dropdown menu will allow you to specify the material you are working in. Then, you can choose the subgroup of that material that is most applicable to your application. In some cases, you will also need to choose a material condition. For example, you can select from “T4” or “T6” condition for 6061 Aluminum. Machining Advisor Pro provides optimized feeds and speeds that are specific to your application, so it is important that the condition of your material is selected. The next section of MAP allows the user to define their specific operation. In this section, you will define the tool path strategy that will be used in this application. This can be done by either selecting the tool path from the dropdown menu, or clicking on “Tool Path Info” for a visual breakdown and more information on each available toolpath. The final section on mobile, and the fourth web section, is the machine section. This is where a user can define the attributes of the machine that you are using. This will include the Max RPM, Max IPM, Spindle, Holder, and work holding security. Running Parameters will adjust based on your responses. Once the Tool, Material, Operation, and Machine sections are populated there will be enough information to generate the initial parameters, speed, and feed. To access these on the mobile app, either swipe left when on the machine tab or tap on the “Output” tab on the bottom menu. Please note that these are only initial values. 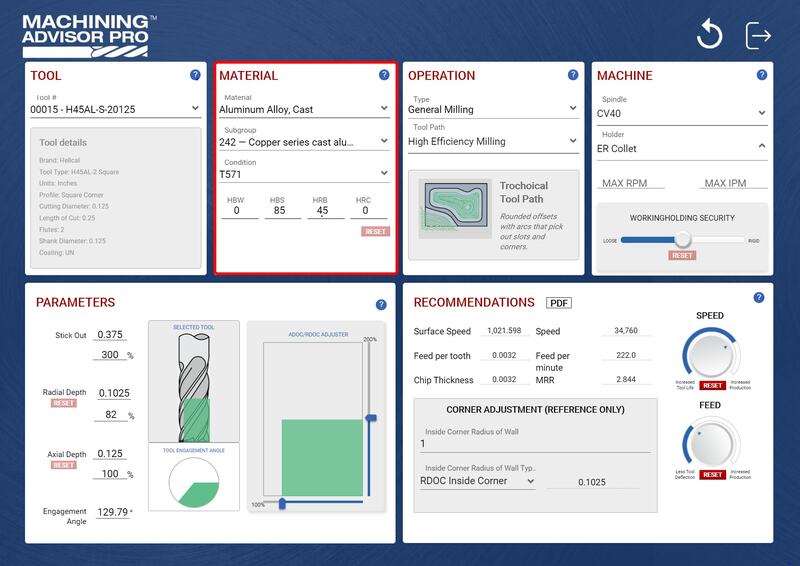 Machining Advisor Pro gives you the ability to alter the stick out, axial depth of cut, and radial depth of cut to match the specific application. These changes can either be made by entering the exact numeric value, the % of cutter diameter, or by altering the slider bars. 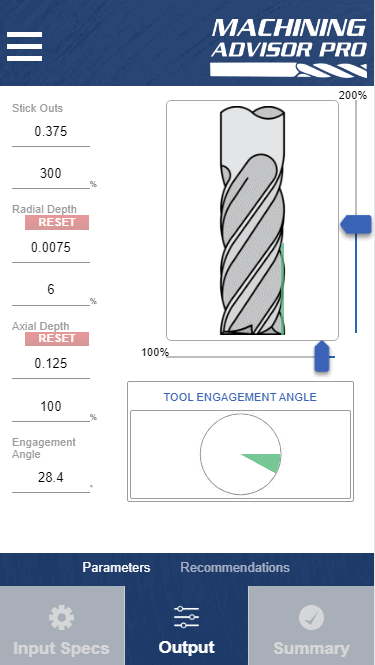 The parameters section also offers a visual representation of the portion of the tool that will be engaged with the materials as well as the Tool Engagement Angle. At this point, you can now review the recommended feeds and speeds that Machining Advisor Pro suggests based on the information you have input. These optimized running parameters can then be further refined by altering the speed and feed dials. Machining Advisor Pro recommendations can be saved by clicking on the PDF button that is found in the recommendation section on both the web and mobile platforms. This will automatically generate a PDF of the recommendations, allowing you to print, email, or share with others. The final section, exclusive to the mobile application, is the “Summary” section. To access this section, first tap on the checkmark icon in the bottom menu. This will open a section that is similar to the “Input Specs” section, which will give you a summary of the total parameter outputs. If anything needs to change, you can easily jump to each output item by tapping on the section you need to adjust. This is also where you would go to reset the application to clear all of the inputs and start a new setup. On the web version, this button is found in the upper right hand corner and looks like a “refresh” icon on a web browser. For the mobile application we have implemented an in-app messaging service. This was done to give the user a tool to easily communicate any question they have about the application from within the app. It allows the user to not only send messages, but to also include screen shots of what they are seeing! This can be accessed by clicking on the “Contact Us” option in the same hamburger menu that the Logout and Help & Tips are found. Have more questions? Check out our MAP FAQs for more information. The ability of the Drill / End Mill to cut along the angled tip as well as the outer diameter gives it the range of operations seen above and makes it an excellent multi-functional tool. 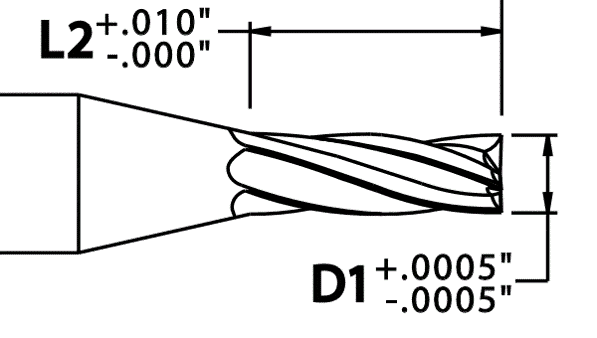 The main difference between Drill / End Mill styles is the point geometry. They are defined by how the flutes are designed on the end of the tool, using geometry typically seen on either an end mill or a drill. While mill style tools follow the features of an end mill or chamfer mill, the drill style geometry uses an S-gash at the tip. This lends strength to the tip of the tool, while giving it the ability to efficiently and accurately penetrate material axially. While both styles are capable of OD milling, mill style tools will be better for chamfering operations, while drill style will excel in drilling. The additional option of the Harvey Tool spiral tipped Drill / End Mill is an unprecedented design in the industry. This tool combines end geometry taken from our helical flute chamfer cutters with a variable helix on the OD for enhanced performance. Versatility without sacrificing finish and optimal performance is the result. This tool is designed for chamfering, milling, drilling non-ferrous materials, and light duty spotting. Drilling and spotting operations are recommended only for tools with an included angle greater than 60°. This is a general rule for all drill mills with a 60° point. Harvey Tool stocks five different angles of 2 flute mill-style Drill / End Mills, which include 60°, 82°, 90°, 100° and 120°. They are offered with an AlTiN coating on all sizes as well as a TiB2 coating for cutting aluminum with a 60° and 90° angle. 4 flute mill-style Drill / End Mills have two flutes that come to center and two flutes that are cut back. This Drill / End Mill is designed for the same operations as the 2 flute style, but has a larger core in addition the higher flute count. The larger core gives the tool more strength and allows it to machine a harder range of materials. The additional flutes create more points of contact when machining, leading to better surface finish. AlTiN coating is offered on all 5 available angles (60°, 82°, 90°, 100°, and 120°) of this tool for great performance in a wide array of ferrous materials. This tool is specifically designed for the combination of milling, drilling, spotting and light duty chamfering applications in ferrous and non-ferrous materials. This line is offered with a 90°, 120°, and 140° included angle as well as AlTiN coating. The Helically Tipped Drill / End Mill offers superior performance in chamfering, milling and light duty spotting operations. The spiral tip design allows for exceptional chip evacuation and surface finish. This combined with an OD variable helix design to reduce chatter and harmonics makes this a valuable tool in any machine shop. It is offered in 60°, 90°, and 120° included angles and comes standard with the latest generation AlTiN Nano coating that offers superior hardness and heat resistance. Stainless steel can be as common as Aluminum in many shops, especially when manufacturing parts for the aerospace and automotive industries. It is a fairly versatile material with many different alloys and grades which can accommodate a wide variety of applications. However, it is also one of the most difficult to machine. Stainless steels are notorious end mill assassins, so dialing in your speeds and feeds and selecting the proper tool is essential for machining success. Stainless steels are high-alloy steels with superior corrosion resistance to carbon and low-alloy steels. This is largely due to their high chromium content, with most grades of stainless steel alloys containing at least 10% of the element. Stainless steel can be broken out into one of five categories: Austenitic, Ferritic, Martensitic, Precipitation Hardened (PH), and Duplex. In each category, there is one basic, general purpose alloy. From there, small changes in composition are made to the base in order to create specific properties for various applications. For reference, here are the properties of each of these groupings, as well as a few examples of the popular grades and their common uses. Austenitic Non-magnetic, outstanding corrosion and heat resistance. 304, 316 Food processing equipment, gutters, bolts, nuts, and other fasteners. Ferritic Magnetic, lower corrosion and heat resistance than Austenitic. 430, 446 Automotive parts and kitchen appliances. Martensitic Magnetic, moderate corrosion resistance – not for severe corrosion. 416, 420, 440 Knives, firearms, surgical instruments, and hand tools. Precipitation Hardened (PH) Strongest grade, heat treatable, severe corrosion resistance. 17-4 PH, 15-5 PH Aerospace components. Duplex Stronger mixture of both Austenitic and Ferritic. 244, 2304, 2507 Water treatment plants, pressure vessels. Choosing the correct tooling for your application is crucial when machining stainless steel. Roughing, finishing, slotting, and high efficiency milling toolpaths can all be optimized for stainless steel by choosing the correct style of end mill. For traditional roughing, a 4 or 5 flute end mill is recommended. 5 flute end mills will allow for higher feed rates than their 4 flute counterparts, but either style would work well for roughing applications. Below is an excellent example of traditional roughing in 17-4 Stainless Steel. For slotting in stainless steel, chip evacuation is going to be key. For this reason, 4 flute tools are the best choice because the lower flute count allows for more efficient chip evacuation. Tools with chipbreaker geometry also make for effective slotting in stainless steel, as the smaller chips are easier to evacuate from the cut. When finishing stainless steel parts, a high flute count and/or high helix is required for the best results. Finishing end mills for stainless steel will have a helix angle over 40 degrees, and a flute count of 5 or more. 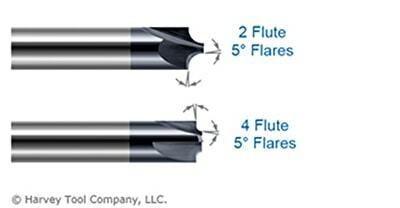 For more aggressive finishing toolpaths, flute count can range from 7 flutes to as high as 14. Below is a great example of a finishing run in 17-4 Stainless Steel. High Efficiency Milling can be a very effective machining technique in stainless steels if the correct tools are selected. Chipbreaker roughers would make an excellent choice, in either 5 or 7 flute styles, while standard 5-7 flute, variable pitch end mills can also perform well in HEM toolpaths. Helical Solutions offers the HEV-5 end mill, which is an extremely versatile tool for a variety of applications. The HEV-5 excels in finishing and HEM toolpaths, and also performs well above average in slotting and traditional roughing. Available in square, corner radius, and long reach styles, this well-rounded tool is an excellent choice to kickstart your tool crib and optimize it for stainless steel machining. While tool selection is a critical step to more effective machining, dialing in the proper running parameters is equally important. There are many factors that go into determining the running parameters for stainless steel machining, but there are some general guidelines to follow as a starting point. Generally speaking, when machining stainless steels a SFM of between 100-350 is recommended, with a chip load ranging between .0005” for a 1/8” end mill up to .006” for a 1” end mill. A full breakdown of these general guidelines is available here. Machining Advisor Pro is a cutting edge resource designed to precisely calculate running parameters for high performance Helical Solutions end mills in materials like stainless steel, aluminum, and much more. 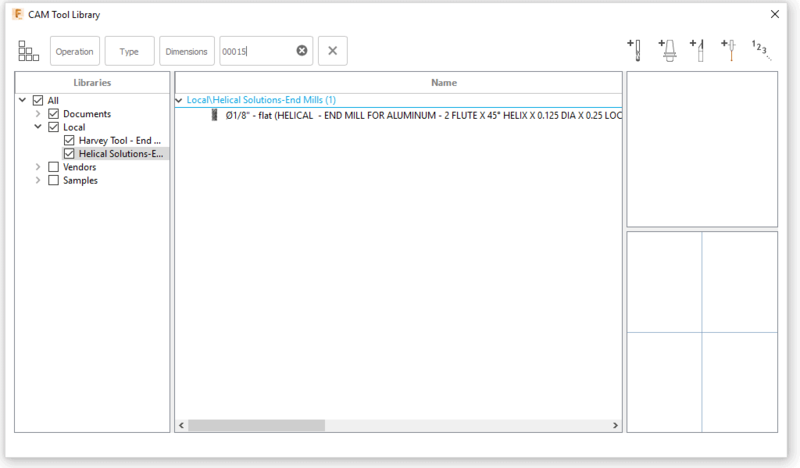 Simply input your tool, your exact material grade, and machine setup and Machining Advisor Pro will generate fully customizable running parameters. This free resource allows you to push your tools harder, faster, and smarter to truly dominate the competition. Stainless steel machining doesn’t have to be hard. By identifying the proper material grade for each part, selecting the perfect cutting tool, and optimizing running parameters, stainless steel machining headaches can be a thing of the past. A Corner Rounding End Mill is typically used to add a specific radius to a workpiece, or in a finishing operation to remove a sharp edge or burr. Prior to selecting your Corner Rounding End Mill, mull the following considerations over. Choosing the right tool will result in a strong tool with a long usable life, and the desired dimensional qualities on your part. Choosing wrong could result in part inaccuracies and a subpar experience. Larger pilot diameters also have more strength than smaller pilot diameters due to the added material behind the radius. A smaller pilot may be necessary for clearance when working in narrow slots or holes. Smaller pilots also allow for tighter turns when machining an inside corner. Putting a full radius on a part has the potential to leave a step or an over-cut on a workpiece. This can happen if the tool isn’t completely dialed in or if there is minor runout or vibration. A slight 5° flare on the pilot and shoulder blends the radius smoothly on the workpiece and avoids leaving an over-cut. A flared Corner Rounding End Mill leaves an incomplete radius but allows for more forgiveness. Additionally, this tool leaves a clean surface finish and does not require a second finishing operation to clean leftover marks. An unflared corner radius leaves a complete radius on the workpiece, but requires more set-up time to make sure there is no step. Choosing between a Corner Rounding End Mill and a Back Corner Rounding End Mill boils down to the location on the part you’re machining. A Back Corner Rounding End Mill should be utilized to put a radius on an area of the part facing the opposite direction as the spindle. While the material could be rotated, and a front Corner Rounding End Mill used, this adds to unnecessary time spent and increased cycle times. When using a Back Corner Rounding End Mill, ensure that you have proper clearance for the head diameter, and that the right reach length is used. If there is not enough clearance, the workpiece will need to be adjusted. 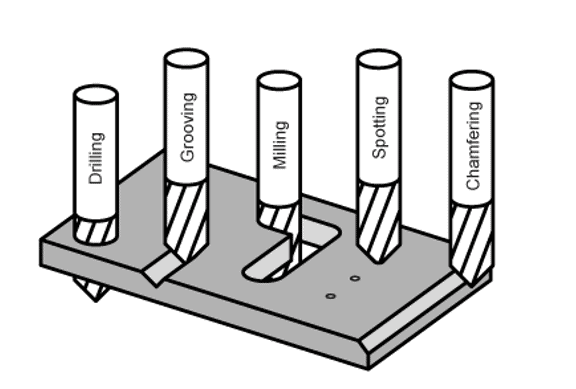 Corner Rounding End Mills are often offered in 2, 3, and 4 flute styles. 2 flute Corner Rounding End Mills are normally used for aluminum and non-ferrous materials, although 3 flutes is quickly becoming a more popular choice for these materials, as they are softer than steels so a larger chip can be taken without an impact on tool life. 4 flutes should be chosen when machining steels to extend tool life by spreading out the wear over multiple teeth. 4 flute Corner Rounding End Mills can also be run at higher feeds compared to 2 or 3 flute tools. The best corner rounding end mill varies from job-to-job. Generally speaking, opting for a tool with the largest pilot diameter possible is your best bet, as it has the most strength and requires less power due to its larger effective cutter diameter. A flared Corner Rounding End Mill is preferred for blending purposes if the workpiece is allowed to have an incomplete radius as this allows more forgiveness and can save on set up time. If not, however, an unflared Corner Rounding End Mill should be utilized. As is often the case, choosing between number of flutes boils down to user preference, largely. Softer materials usually require fewer flutes. As material gets harder, the number of flutes on your tool should increase. Machinists face many problems and challenges when manufacturing gummy materials. These types of materials include low carbon steels, stainless steels, nickel alloys, titanium, copper, and metals with high chromium content. Gummy materials have a tendency to produce long, stringy chips, and are prone to creating built-up edge. These common problems can impact surface finish, tool life, and part tolerances. Continuous chips are long, ribbon-like chips that are formed when the tool cuts through a material, separating chips along the shear plane created by the tool’s cutting edge. These chips slide up the tool face at a constant flow to create a long and stringy chip. The high temperatures, pressures, and friction produced when cutting are all factors that lead to the sticky chips that adhere to the cutting edge. When this built up edge becomes large enough, it can break off leaving behind some excess material on the workpiece, or gouge the workpiece leaving a poor surface finish. Using large amounts of coolant can help with temperature control and chip evacuation while machining gummy materials. Temperature is a big driving force behind built-up edge. The higher the temperature gets, the easier and faster a built-up edge can form. Coolant will keep local temperatures lower and can prevent the material from work hardening and galling. Long, stringy chips have the potential to “nest” around the tool and cause tool failure. Coolant will help break these chips into smaller pieces and move them away from the cutting action by flash cooling them, resulting in fracturing of the chip into smaller pieces. Coolant should be applied directly to the contact area of the tool and workpiece to have the maximum effect. The tool should be constantly fed into the workpiece. Allowing the tool to dwell can cause work hardening and increase the chance of galling and built up edge. A combination of higher feed rates and lower speeds should also be used to keep material removal rates at a reasonable level. An increase in feed rates will raise the temperature less than an increase in speed. This relates to chip thinning and the ability of a tool to cut the material rather than rub against it. Climb milling is the preferred method as it directs more heat into the chip than the tool. Using climb milling, the largest chip cross section is created first, allowing the tool to cut through the material much easier. The heat generated from friction when the tool penetrates the workpiece is transferred to the chip rather than the tool because the thickest part of the chip is able to hold more heat than the thinnest. Sudden, large changes in force, like when a tool initially engages a workpiece, have a negative impact on tool life. Using an arc-in tool path to initially engage the material allows for increased stability with a gradual increase in cutting forces and heat. A gradual tool entry such as this is always the preferred method over an abrupt straight entry. A tool with a sharp and robust cutting edge should be selected to machine gummy materials. Helical has tooling specifically designed for Titanium and Stainless Steel to make your tool selection process easy. Additionally, choosing a tool with the correct coating for the material you are machining will help to protect the cutting edge and result in a far lower chance of built up edge or galling than an uncoated tool. A tool with a higher flute count can spread tool wear out over multiple cutting edges, extending tool life. Tool wear is not always linear in gummy materials; as soon as a little bit of wear appears, tool failure will happen relatively quickly. Changing the tool at the first sign of wear may be necessary to ensure that parts are not scrapped. Every material machines somewhat differently, but understanding what is happening when the tool cuts the workpiece and how this affects tool life and finish will go a long way to successfully completing any job. 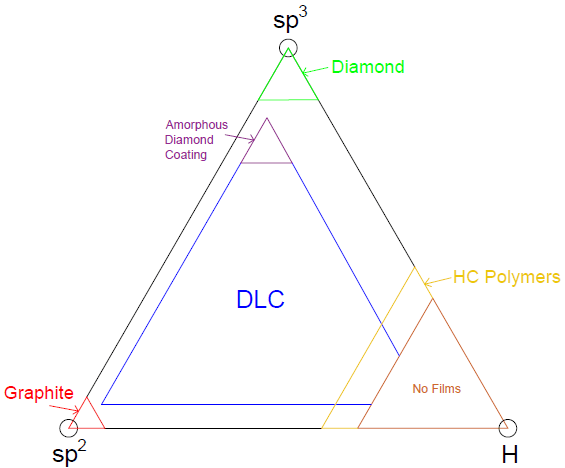 Built-up edge and excess heat can be minimized by selecting the correct tool and coating for the material, and following the tips and techniques mentioned above. Finally, be sure to check your machine’s runout and ensure maximum rigidity prior to beginning your machining operation. In manufacturing large production runs, one of the biggest difficulties machinists experience is holding tooling to necessary tolerances in holes, walls, and threads. Typically, this is an iterative process that can be tedious and stressful, especially for inexperienced machinists. 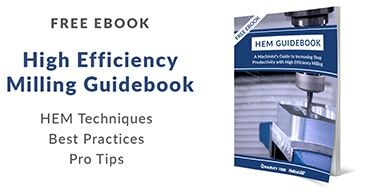 While each job presents a unique set of challenges, there are rules of thumb that can be followed to ensure that your part is living up to its accuracy demands. A tolerance is an allowable amount of variation in a part or cutting tool that a dimension can fall within. When creating a part print, tolerances of tooling can’t be overlooked, as tooling tolerances can result in part variations. Part tolerances have to be the same, if not larger, than tool tolerances to ensure part accuracy. Cutting tool tolerances are oftentimes applied to a tool’s most critical dimensions, such as Cutter Diameter, Length of Cut, Shank Diameter, and Overall Length. When selecting a cutting tool for a job, it’s critical to choose a brand that adheres to strict tolerance standards and reliable batch-to-batch consistency. Manufacturers like Harvey Tool and Helical Solutions prominently display tolerances for many critical tool dimensions and thoroughly inspect each tool to ensure that it meets the tolerances specified. Below is the table header for Harvey Tool’s line of Miniature End Mills – Square – Stub & Standard. Tolerances help to create repeatability and specificity, especially in an industry in which even a thousandth of an inch can make or break a final product. This is especially true for miniature tooling, where Harvey Tool is experienced in the designing and manufacturing of tooling as small as .001” in diameter. Holes oftentimes mandate the tightest dimensional tolerances, as they generally are meant to align perfectly with a mating part. To maintain tolerances, start first by testing the runout of both your machine and your tool. This simple, yet often overlooked step can save machinists a great amount of time and frustration. Spotting Drills allow for drills to have a very precise starting point, minimizing walking or straying from a desired path. This can be especially beneficial when machining irregular surfaces, where accessing a hole’s perfect location can be more difficult. Reaming is great for any very tight tolerance mandate, because many Miniature Reamers have much tighter tolerances than a drill. Harvey Tool’s Miniature Reamers, for example, have tolerances of +.0000″/-.0002. for uncoated options and +.0002″/-.0000″ for AlTiN coated tools. Reamers cut on their chamfered edge, removing a minimal amount of material within a hole with the ultimate goal of bringing it to size. Because the cutting edge of a reamer is so small, the tool has a larger core diameter and is thus a more rigid tool. Maintaining tolerances when machining walls is made difficult by deflection, or the curvature a tool experiences when a force is applied to it. Where an angle is appearing on a wall due to deflection, opt for a reached tool to allow for less deflection along the tool’s neck. Further, take more axial depths of cut and machine in steps with finishing passes to exert less pressure on the tool. For surface finish tolerances, a long fluted tool may be required to minimize evidence of a tool path left on a part. For more information on ways to minimize deflection, read Tool Deflection & Its Remedies. Corner radius End Mills, because they do not feature a sharp edge, will wear slower than a square end mill would. By utilizing corner radius tooling, fracturing on the tool edge will be minimized, resulting in an even pressure distribution on each of the cutting edges. 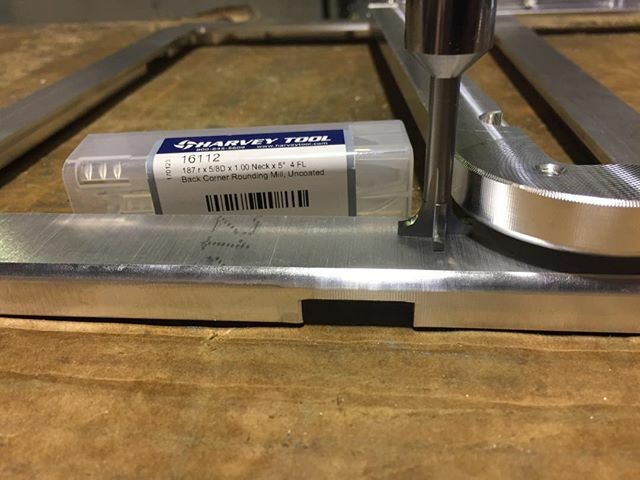 Because the sharper edge on a square tool is less durable and more prone to cracking because of the stress concentration on that point, a corner radius tool would be much more rigid and thus less susceptible to causing a tolerance variation. For this reason, it’s recommended to use a roughing tool with a corner radius profile and a finisher with a square profile for an edge tolerance. When designing a part and keeping manufacturing in mind, if there is a potential for a wall with a radius as opposed to a wall with a square edge, a wall with a radius allows for easier machineability and fewer tool changes. Making threads to tolerance is all about chip evacuation. Evacuating chips is an issue commonly overlooked; If chips within a hole have not been removed before a threading operation, there could be interference in the tool tip that leads to vibration and chatter within a thread. This would decrease the continuity of the thread while also altering the points of contact. 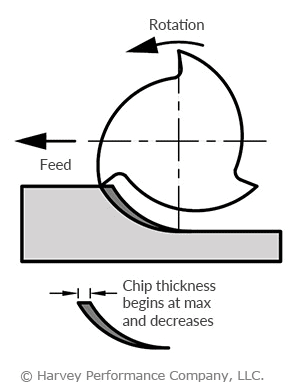 Discontinuity of a thread could be the difference between passing and failing a part, and because threading is typically the last application when machining to decrease damaging the threads, it also increases the likelihood of chips remaining within the hole from other applications. 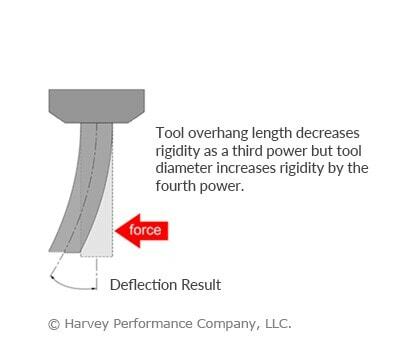 If you continue to experience troubles maintaining tight tolerances despite this blog post, consult the Harvey Tool or Helical Solutions tech team, as the problem may exist outside of your machine. Temperature and humidity can vary how gummy a material is, and can lead to workpiece expansion and contraction. Additionally, the foundation of buildings can expand and contract due to outside temperature, which can result in upped runout and irregular vibration in a spindle.